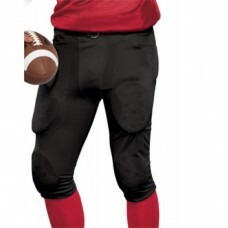 Shop4teams football pants for your team at the guaranteed lowest price. Save big money on tough and durable adult football pants. We carry official game and practice football pants in your choice of colors, styles, features and fabrics. Assorted choices include stretch dazzle slotted waistband football pants, snap waistband football pants, football pants with built-in pads, striped football pants, spandex pro football pants, polyester practice pants, and dazzle football pants, just to name a few. But there's so much more! It's all about saving your team money on top notch quality football uniforms at Shop4teams. Great looking in stock youth football pants at discounted prices for the team and individual from a variety of manufacturers including Teamwork, Holloway, Badger, and Augusta. Choose from styles in adult and youth sizes. With our guaranteed lowest prices and fantastic selection, Shop4teams is the best online dealer for in stock football uniforms for your team. Size chart 100% polyester double knit. 5-panel construction. 7 sewn-in EVA pads (hips, tail, th.. Size chart 92% polyester/8% spandex warp knit. 5-panel construction * Contrast-color side inser..